Can scientists look at next year's climate? Is it possible to make valid climate predictions that go beyond weeks, months, even a year? UCLA atmospheric scientists report they have now made long-term climate forecasts that are among the best ever — predicting climate up to 16 months in advance, nearly twice the length of time previously achieved by climate scientists. Forecasts of climate are much more general than short-term weather forecasts; they do not predict precise temperatures in specific cities, but they still may have major implications for agriculture, industry and the economy, said Michael Ghil, a distinguished professor of climate dynamics in the UCLA Department of Atmospheric and Oceanic Sciences and senior author of the research. The study is currently available online in the journal Proceedings of the National Academy of Sciences (PNAS) and will be published in an upcoming print edition of the journal. "Certain climate features might be predictable, although not in such detail as the temperature and whether it will rain in Los Angeles on such a day two years from now," said Ghil, who is also a member of UCLA's Institute of Geophysics and Planetary Physics. "These are averages over larger areas and longer time spans." Long-term climate forecasts could help predict El Niño events more than a year in advance. El Niño is a climate pattern characterized by the warming of equatorial surface waters, which dramatically disrupts weather patterns over much of the globe and strikes as often as every second year, as seldom as every seventh year or somewhere in between. A major issue addressed by Ghil and his colleagues in the PNAS research is the difficulty of separating natural climate variability from human-induced climate change and how to take natural variability into account when making climate models. For the study, Ghil and his UCLA colleagues Michael Chekroun and Dmitri Kondrashov of the department of atmospheric and oceanic sciences analyzed sea-surface temperatures globally. To improve their forecasts, they devised a new algorithm based on novel insights about the mathematics of how short-term weather interacts with long-term climate. Weather covers a period of days, while climate covers months and longer. As is customary in this field, Ghil and his colleagues used five decades of climate data and test predictions retrospectively. For example, they used climate data from 1950 to 1970 to make "forecasts" for January 1971, February 1971 and beyond and see how accurate the predictions were. They reported achieving higher accuracy in their predictions 16 months out than other scientists achieved in half that time. The research was federally funded by the U.S. Department of Energy and the National Science Foundation. Ghil also led a separate, three-year European Commission–funded project called "Extreme Events: Causes and Consequences" involving 17 institutions in nine countries. In a recent paper on extreme events, published this summer in the journal Nonlinear Processes in Geophysics, Ghil and colleagues addressed not only extreme weather and climate but extreme events such as earthquakes and other natural catastrophes, and even extreme economic events. Their study included an analysis of the macro-economic impact of extreme events. "It turns out, surprisingly, that it is worse when catastrophes occur during an economic expansion, and better during a recession," Ghil said. "If your roof blows off in a hurricane, it's easier to get somebody to fix your roof when many people are out of work and wages are depressed. This finding is consistent with, and helps explain, reports of the World Bank on the impact of natural catastrophes." 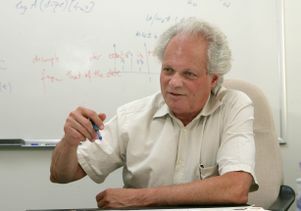 Ghil spoke this past July about a mathematical theory of climate sensitivity at the International Congress on Industrial and Applied Mathematics, in Vancouver, a quadrennial event that showcases the most important contributions to the field over the preceding four years.